The George Washington Bridge is a toll suspension bridge spanning the Hudson River, connecting Washington Heights in the Manhattan to Fort Lee in New Jersey by means of Interstate 95, U.S. Route 1/9. U.S. Route 46 ends halfway across the bridge at the state border. 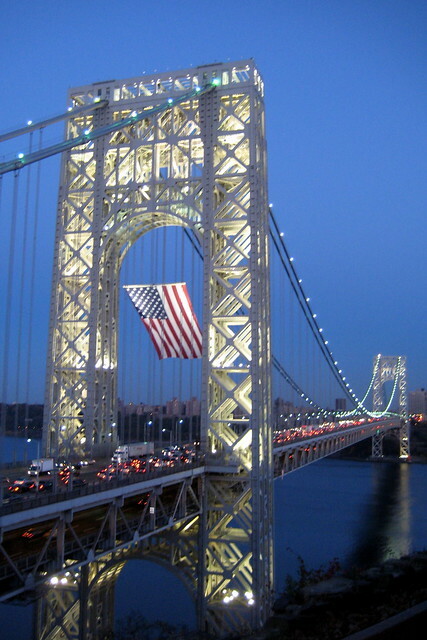 Initially named the Hudson River Bridge, it was renamed in honor of George Washington, who fortified positions on both ends–Fort Washington and Fort Lee–during the American Revolutionary War. The GWB is one of the world’s busiest bridges in terms of vehicle traffic. It carries over 100,404,000 vehicles annually, with current AADT daily estimates of nearly 300,000.